AEC students staging protest on NH 37 in Guwahati. 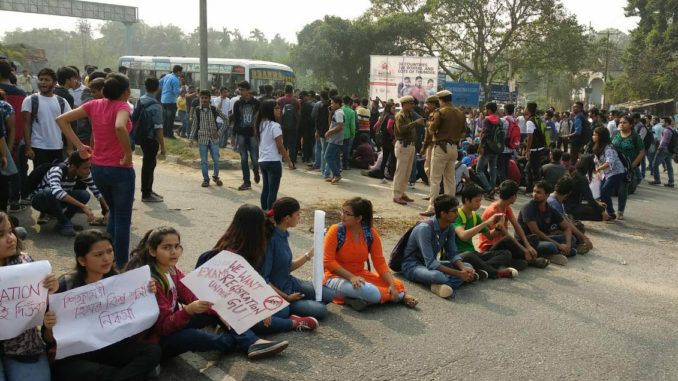 Students of Assam Engineering College (AEC) on Thursday staged a protest on NH 37 at Jalukbari in Guwahati against the state government’s directive to seek affiliation to the Assam Science and Technology University (ASTU). The students said ASTU was putting pressure on Assam Engineering College authorities for affiliation, a missive the college had ignored previously. AEC is affiliated to Gauhati University and the government has now decided to change the affiliation to the newly established ASTU to bring all engineering colleges under one roof. But the students argued that ASTU does not have proper infrastructure and accreditation of the National Assessment and Accreditation Council (NAAC). Hundreds of angry AEC students holding play card blocked NH 37 at Jalukbari demanding withdrawal of the order. They also slammed State Education Minister Himanta Biswa Srama. The AEC Students’ Union said the college received a fresh missive saying the All India Council for Technical Education (AICTE) had asked the university to start the affiliation process as soon as possible. The students alleged that ASTU officials had allegedly sent misleading minutes of a meeting between the faculty members of AEC and ASTU officials to the government stating that the engineering college teaching fraternity wanted the institute to be affiliated to it. Based on this, the government ordered the director of technical education to order the college to apply for affiliation under ASTU. “We will in no way allow the change of affiliation of our college. The Government gave us written assurance that it would not go ahead with the decision, but it has not scrapped the order till today,” the union general secretary Abinash Medhi said. Reacting to the union’s protest, ASTU authorities earlier had said it did not send the directive for change of affiliation. “We are following government rules,” an ASTU official had said.